Find artworks, auction results, sale prices and pictures of Hendrick Avercamp at auctions worldwide. 9 1/4 by 12 1/4 in. ; 23.5 by 31.2 cm. 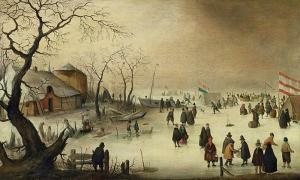 Washington, The National Gallery of Art, Hendrick Avercamp: The Little Ice Age, 21 March 2010 - 5 July 2010. Thence by direct family descent. oil on oak panel current dimensions: 69.2 by 109 cm. ; 27 by 43 in. original dimensions: circa 55 by 109 cm. Hendrick Avercamp (Amsterdam 1585-1634 Kampen) A winter landscape with figures on the ice by a koek-en-zopie tent oil on panel 9½ x 15½ in. (24 x 39.2 cm.) In an early seventeenth-century, possibly the original, Dutch cassetta frame with an ogee frieze. Private collection, France. with Noortman, Maastricht, from whom acquired, on 29 October 1998, by Pieter and Olga Dreesmann (inventory no. B1). Q. Buvelot, H. Buijs and E. Reitsma, A Choice Collection. Seventeenth-Century Dutch Paintings from the Frits Lugt Collection, exhibition catalogue, Zwolle, 2002, pp. 46-7, under no. 2, fig. 2e. P. Roelofs, et al., Hendrick Avercamp -- Master of the Ice Scene, exhibition catalogue, Amsterdam, 2009, pp. 62-5, and 176, figs. 63 and 68. 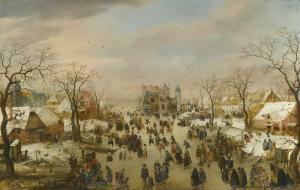 Amsterdam, Rijksmuseum; and Washington, National Gallery of Art, Hendrick Avercamp -- Master of the Ice Scene, 21 March 2009-5 July 2010, no. 63. Hendrick Avercamp was baptised in the Oude Kerk in Amsterdam in 1585, the eldest son of Barent Avercamp, a Frisian teacher at the local Latin school, and Beatrix Vekemans, the daughter of the school's Flemish rector. He grew up in Kampen, a small harbour town on the eastern shore of the Zuiderzee, that was to provide the setting for virtually all of his artistic output. In or around 1607, the young artist returned to Amsterdam for his apprenticeship, probably under the portraitist and history painter Pieter Isaacsz. 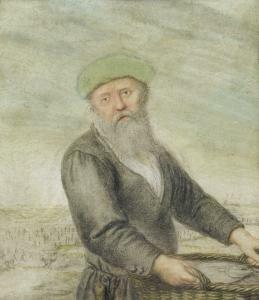 (1568/9-1625). However, Avercamp's main formative influence was the Flemish landscape tradition and he must have become familiar in these early years with the imagery of Hans Bol, Pieter Brueghel and David Vinckboons. Back in Kampen, Avercamp set out on his own, rapidly evolving his highly distinctive style and establishing himself as the first North Netherlandish artist to specialise in winter landscapes. Little is known about his life in Kampen or his working practice, but much is made of the fact that he was mute and possibly also deaf (he was known as 'de stomme') and thus, by inference, that he was blessed with a heightened sensitivity to the visual world. His mother, in her will of 1633, referred to her eldest unmarried son as 'mute and miserable' though his paintings, by contrast, are invariably joyous without any brooding undertones. The Dreesmann picture, which is a relatively new addition to the Avercamp oeuvre, adopts as its subject an expansive view over the ice on a freezing winter's day. Travellers on the ice are assembling at a koek-en-zopie tent for refreshments and smoke billows out invitingly into the chilled air. The fishermen, who have recently opened a hole in the ice, appear to have abandoned their work and also made for the warmth of the tent. In the foreground, an elderly couple are seen pushing a tethered calf (perhaps sickly) across the ice on a hand-sled. The slightly lowered and advanced viewpoint, that places greater emphasis on the figures, suggests a likely date of circa 1620-25. This dating is supported by a dendrochronological analysis of the panel, carried out by Dr Peter Klein in 2009, which establishes a likely date of 1610 onwards for use of the support for painting (report available on request). It was typical, particularly with his output from this date, for Avercamp to incorporate in his paintings elements drawn from a large repertoire of drawings. In the present work, the couple in the foreground recur in a drawing of A duck-hunter and Figures on the Ice in the Rijksprentenkabinet, Amsterdam (figs. 1 and 2), in which they are seen pushing a barrel on their sled. In the right background of the same sheet is the crouching figure with a bird-trap that appears in approximately the same position in the Dreesmann painting. In another sheet in the Rijksprentenkabinet, a horse is drawn eating from a sleigh in much the same manner as that seen outside the tent in the present work. The hole in the ice with the displaced chunk, the bucket and the axe next to it, all appear in another drawing in the Kupferstichkabinett, Hamburg. The same sheet also includes the crouching figure with the bird-trap and a horse-drawn sleigh carrying three figures moving away into the distance, who are also seen in the centre right background of this painting. The pose of the horse, with front leg raised, is identical. Hans Buijs (op. cit.) was the first to suggest that the present work may originally have formed the pendant to the Riverscape at Kampen in the Frits Lugt Collection, Fondation Custodia, Paris (fig. 3). As well as being consistent from a stylistic point of view, both panels share exactly the same dimensions and the horizon lines correspond precisely, making it tempting to consider that the two pictures were conceived as a pair representing Summer and Winter. Öl auf Holz. 31 x 52,5 cm. Auktion Amsterdam, 6.10.1801, Nr. 1. - A. Katz, Dieren (vor 1940). - Slg. J. L. ten Bos, Almelo, 1949. - Slg. E.H.F.W. van Schaeck Mathon, Aerdenhout. - Slg. K. L. Sander, Bloemendaal, 1963. - Slg. Wiggin Prescott. Versteigerung dieser Slg. bei Christie´s New York 9.1.1981, Nr. 21. - David Koetser, Genf. - Deutsche Privatsammlung. "Avercamp", Rathaus Kampen 9.7.-13.8.1949, Nr. 5.- "Hendrick Avercamp - Barend Avercamp. Frozen silence." K. V. Waterman, Amsterdam 1982, Nr. 3. 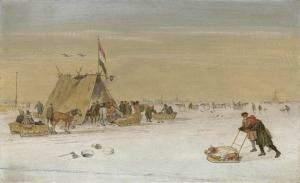 Clara Johanna Welcker: Hendrick Avercamp, Doornspijk1979, S. 205, Nr. 514.6. Hendrick Avercamp stammte aus einer angesehenen Bürgerfamilie aus Kampen. Sein Großvater mütterlicherseits war der bedeutende Gelehrte Petrus Meerhoutanus. Nach seiner Ausbildung in Amsterdam zog er sich zurück in seine Heimatstadt an der Mündung der Ijssel, wo er bis zu seinem Lebensende blieb. Wegen seiner angeborenen Stummheit wurde er "Der Stumme von Kampen" genannt. Schon zu seinen Lebzeiten waren seine Bilder bei Sammlern sehr begehrt. Avercamp ist ein außergewöhnlicher Künstler am Beginn der Blütezeit der holländischen Kunst. Er war einer der ersten niederländischen Maler, die sich auf eine naturgetreue Darstellung der heimatlichen Landschaft spezialisierten. Von besonderem Reiz sind seine mit unzähligen Menschen bevölkerten Winterlandschaften, die sogenannten "Wintertjes", einer Bildgattung, zu der auch unser Bild gehört. Aufgrund seiner malerischen Qualitäten stellt es ein herausragendes Werk im Schaffen des Künstlers dar. Es zeigt einen zugefrorenen Fluss, auf dem sich zahlreiche Figuren tummeln und unterschiedlichen Tätigkeiten nachgehen: Manche fahren Schlitten, schnüren - sitzend oder stehend - Ihre Schlittschuhe, andere unterhalten sich oder gehen spazieren. für diese Bilder abgeleitet wurde. 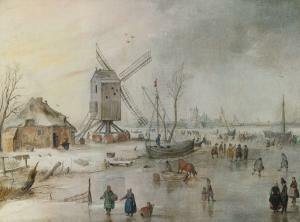 This winter landscape by Hendrick Avercamp is an outstanding work by the painter because of the artistic quality. The painting shows a frozen river where numerous figures are moving about engaged in various activites: some are sleigh-riding, are fastening their ice skates - either sitting or standing - others are talking to one another or are walking around. (fun on ice) was used for this style of painting.